Book Culture, on 114th near Broadway, is launching a new book 7 pm Tuesday June 25–“Change at Jamaica”, by Marshall Messer. Messer steers this story from the viewpoint of a New York City cabbie, college dropout, Woodstock follower, and blues harpist. Meet him and support our local independent bookstore! 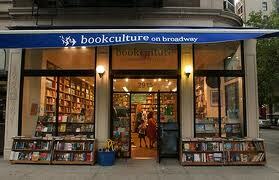 Book Culture has frequent visiting authors, discussions, and readings. July 1st, 7pm, we can hear Marlene Lee read excerts from “The Absent Woman”. Rumor has it that Lee used to be our neighbor when she lived on 103rd street. Your children can hear children’s stories in several languages. German story time is every Thursday 4.30pm; French twice a week on Tuesday and Wednesdays at 4pm; and Spanish on Fridays at 3.30pm. Or practice your own comprehension skills! And by the way, Book Culture has a wonderful collection of erudite, less common magazines.